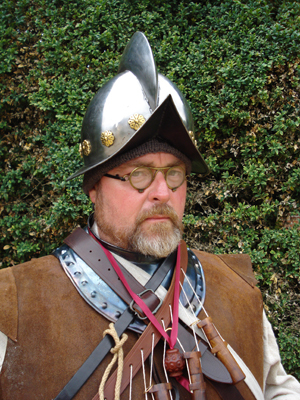 Characters Representing The Tudor Period | Select Society – The Past Recaptured! Undoubtedly our country’s most colourful monarch! The King, aged in his early 50s, appears in the most splendid bejewelled and golden costume; a near replica of the famous Holbein portrait. This portrayal of the ‘King’, in the later years of his life, is based upon the most detailed research. The ‘King’ recounts his life, telling of his wives, children, and the events of his long reign, in a most forceful fashion. He is ill and is greatly pained by his badly infected leg and, although recently married to his sixth wife, he appears an angry and vengeful man! This is a highly acclaimed and powerful presentation that is offered in the form of an ‘audience’ with the ‘King’, during the course of which, the public are invited to question and ‘petition’ their Monarch. ‘Simpkin’, a Tudor Privateer and Explorer, served with Captain Drake during his circumnavigation of the world. He has many tales to tell; of the hardship of life on board ship, of visiting far off lands, of involvement with the slave trade, and of battling against the Spanish as, it should be remembered, one man’s ‘Privateer’ is another man’s ‘Pirate’! This presentation, which deals with the issues surrounding exploration, trade, slavery, and piracy, is suitable for both an interior and an exterior setting, particularly one with a maritime link, and is illustrated by a range of items supporting the various themes. ‘Cratewell’, the Executioner in London during the 16th century, is resplendent in black, and equipped with his ‘heading axe’, block ropes, knives, and the other ‘tools’ of his gruesome trade. ‘Cratewell’ recounts the nature of crime and punishment during turbulent years of the Tudor dynesty. In the 38 year reign of King Henry VIII, in excess of 72,000 people were executed! Stories of hanging, mutilation, and decapitation are complimented by accounts of significant executions – those of principle Courtiers and, of course, two of King Henry’s wives. Particular attention is given to the story of Queen Anne Boleyn (executed in 1536) for which appropriate and period specific ‘props’ are used. The presentation, which is suitable for an exterior location, is complemented by 12’ gallows (complete with ‘body’! 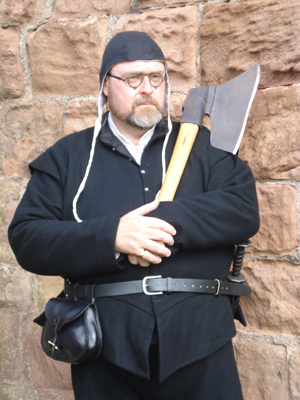 ), a pillory, and an array of period accurate items and equipment.